NIC Belasco is finally back in the PBA after his retirement two years ago. Only this time he returns as part of the Phoenix Fuel Masters coaching staff. Belasco, 42, has been named an assistant coach of the Fuel Masters under the new head tactician Ariel Vanguardia, marking the second pick overall of the 1997 PBA rookie draft's first foray into coaching in the pro ranks. “I’ve been out of the PBA for two years. I’ve been trying to get back to the PBA,” Belasco said when SPIN.ph caught up with him at the end of a coaching clinic supervised by dribble-drive offense proponent Vance Walberg. Prior to this coaching job, Belasco formed the Belasco Unlimited Skills Academy (Busa) where he has trained teams in the 16-under and corporate leagues, as well as a semi-professional team playing in the Filsports Basketball Association (FBA). 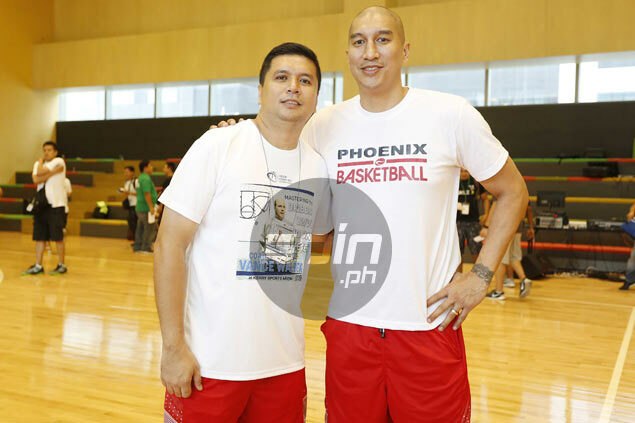 It's also a reunion of sorts for Belasco and Vanguardia, the same person responsible for the eight-time PBA champion's second chance at basketball. If not for Vanguardia, Belasco said he probably would be a sheriff's deputy in the US. “I’m really blessed to know coach Ariel. For some reason, he keeps bringing me back to basketball,” said Belasco. “In 2010, I was retired. I was in the States and he brought me to Malaysia to become his Asean import so this is the second time he has brought me from the outside and back here. If he didn’t bring me in 2010, I will still be in the States and probably be a sheriff’s deputy or something,” he added. “When I was in Malaysia, our condos were right next to each other. (At) two or three in the morning, I can hear him watching videos all night long. So to me, I said to myself, ‘This guy is masipag.’ He works hard, he studies the game, so me coaching, I’m happy to be with him. I get to learn from him, and learn from the people he is connected to,” said Belasco. As he looks to help Vanguardia with the Fuel Masters, Belasco’s goal is to make a significant contribution to the team's progress. “This is really what I want to do the rest of my life. I think I have a lot to offer and I’m just happy in this position where I can contribute,” said Belasco.